The (still!) frontrunner for the Republican presidential nomination had scheduled packed day of D.C.-area events. Eight o’clock in McLean, in the tony suburbs. Two and a half hours later in Alexandria. Then, back into the city to talk to the Republican-dominated Health Care Caucus before meeting with more Republicans at the Capitol Hill Club, their traditional nearby hangout. I caught up with Cain at the caucus meeting. Inside was caucus founder Rep. Michael Burgess, a medical doctor from the Dallas-Fort Worth metroplex, holding court with a dozen reporters. He was sympathetic to Cain, somewhat welcoming of the surge of reporters. I asked Burgess if he’d been paying attention to Cain’s answers about the harassment story. He had a sarcastic barb ready. When the Q&A began, the media outnumbered the members by a ratio of around six to one. The questions – from the members, only – were friendly. Rep. Andy Harris, R-Md., asked Cain how he’d win the argument that Medicare needed to be reformed. He’d convince the country that Medicare was unsustainable and that Medicare should be turned into block grants, so states could experiment with care. The next question was partly about messaging, too. Cain had a larger point about that. 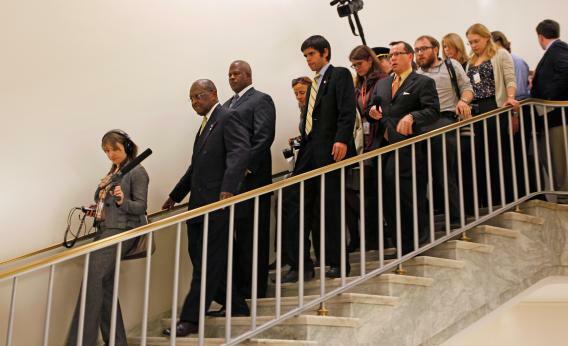 Cain left after 20 minutes, ignoring some shouted questions from the press – “Will you release the women from the confidentiality clause?” – shaking hands, and going to the next appointment. The members who’d heard him said he’d said all the right things; and anyway, the story would burn out eventually.